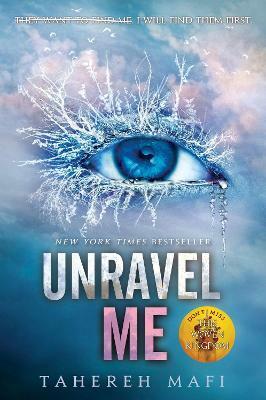 The thrilling second installment in New York Times bestselling author Tahereh Mafi's Shatter Me series. She and Adam were able to escape Warner's clutches and join up with a group of rebels, many of whom have powers of their own. Juliette will finally be able to actively fight against The Reestablishment and try to fix her broken world. And perhaps these new allies can help her shed light on the secret behind Adam's--and Warner's--immunity to her killer skin. Juliette's world is packed with high-stakes action and tantalizing romance, perfect for fans of the Red Queen series by Victoria Aveyard and the Darkest Minds trilogy by Alexandra Bracken. Ransom Riggs, #1 New York Times bestselling author of Miss Peregrine's Home for Peculiar Children, raved: "A thrilling, high-stakes saga of self-discovery and forbidden love, the Shatter Me series is a must-read for fans of dystopian young-adult literature--or any literature!" Our lips touch and I know I'm going to split at the seams. He kisses me softly then strongly like he's lost me and he's found me and I'm slipping away and he's never going to let me go. Juliette has escaped from The Reestablishment. Now she's free from their plan to use her as a weapon, and free to love Adam. But Juliette will never be free from her lethal touch. Or from Warner, who wants Juliette more than she ever thought possible. Haunted by her past and terrified of her future, Juliette knows that she will have to make some life-changing choices. Choices that may involve choosing between her heart--and Adam's life. Tahereh Mafi is a girl. She was born the youngest child with four older brothers in a small city somewhere in Connecticut, and currently resides in Orange County, California, where the weather is just a little too perfect for her tastes. She graduated from a tiny liberal arts college two miles from the shores of Laguna Beach, has varying levels of competency in eight different languages and spent a semester abroad in Barcelona, Spain, where she had the opportunity to study Spanish literature in its native form. Shes traveled all over the world, lived on both sides of the country, and even spent some years writing really bad poetry. When unable to find a book, she can be found reading candy wrappers, coupons, and old receipts. She has no idea how to multiply big numbers in her head, and hopes to God no one will ever ask her to.